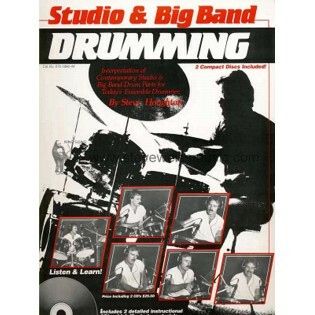 The purpose of Steve Houghton's Studio & Big Band Drumming is to provide the drummer with the fundamental skills to perform in a studio orchestra, big band, show band, or small combo. The book includes ideas and philosophies concerning how to play musically with any type of ensemble. The book covers different musical styles, fills/setups, jazz phrasing, chart reading, and several other concepts that are invaluable to the gigging drummer. Two CD's are included with the book containing recordings of several of the concepts discussed in the book. Fast, efficient shipping, good communication and great book for jazz and latin phrasing for drumset. Great transaction all around. The book teaches you how to set up brass figures, and play along with ensemble ques. The CD interprets the written figures. There is a lot to learn here, and much to study and play for someone who wants to be able to swing. Great book for learning how to read and interpret different chart figures during performance such as section figures or ensemble passages. It teaches some stylistic elements as well. Lots of info on how to set up ensemble figures and what the best sounds are to support section figures depending on the instruments playing. Definitely get this book. Very helpful for college jazz bands.